Plaice, also known as flatfish, is a low-calorie, low-fat type of seafood that can be suitable for low-carbohydrate diets, as it is carbohydrate free. Plaice is also a rich source of protein, so the fish can be a beneficial addition to your diet. Note that different methods of cooking, such as frying, will alter the nutritional value of plaice. Plaice is low in calories. An 100 g serving of raw plaice contains just 85 calories, which comprises less than 5 percent of the daily recommended intake of 2,000. If you're dieting, plaice can be a good choice, because you can burn the calories it provides relatively quickly. A 10-minute session of swimming laps or 6 minutes of rollerblading would be sufficient to burn 85 calories. 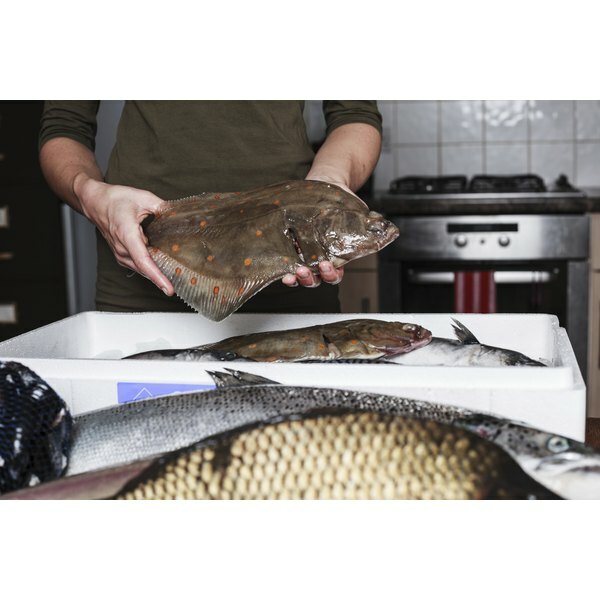 Plaice is a good source of protein, as each 100 g serving of raw plaice provides 18 g. This amount is equivalent to three eggs, but with many fewer calories, as three eggs would provide 210 compared with the 85 in 100 g of raw plaice. Consuming adequate levels of protein is vital, as the nutrient promotes muscle gain, and, according to October 2004 research from "Journal of the American College of Nutrition," increased protein intake can also enhance weight and fat loss. Plaice is low in fat, with just 2 g in each 100 g of raw plaice. None of this fat is saturated, a type of fat that may increase your cholesterol levels. Dietary fat is essential for your health, as it provides energy, aids in growth and development and helps your body absorb vitamins. Plaice can be a suitable addition to low-carbohydrate diets, as the fish does not contain any carbohydrates. Carbohydrates are your body's primary source of energy, but restricting carbohydrates can aid in weight loss. Although some types of seafood are high in sodium, plaice is not. An 100 g serving of raw plaice contains no sodium. Sodium is a vital nutrient, but consuming too much sodium can cause fluid retention or high blood pressure.